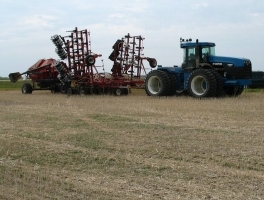 Choosing the best seeding date for a crop requires consideration of many factors, including the growing conditions required for the chosen crop, growing season length, soil moisture and temperature conditions, as well as weed dynamics in the field. Seeding date manipulation for weed control involves trying to increase the crop’s competitive ability compared to that of the weeds. The timing of weed emergence relative to the crop is the main factor to consider, since weeds that emerge before the crop compete more aggressively with the crop than those that emerge after the crop. Therefore, manipulating seeding dates for weed control requires some knowledge of when and under what conditions different weeds emerge. Delayed seeding is often used to allow for control of early-emerging weeds such as wild oat. This practice can be combined with strategic tillage operations in a method known as stale or false seedbed (see Spring Tillage). Early seeding may be recommended when problem weeds are later-emerging, such as green foxtail. In northern Alberta, a six-year crop rotation including delayed seeding in three years out of six resulted in a 87% decrease in wild oat populations, compared to a 4% decrease in a wheat-fallow rotation (Principles and Practices of Commercial Farming, 1968). In another Alberta study, allowing wild oat to grow to the two-leaf stage and then destroying it with either tillage or herbicides prior to seeding rapeseed resulted in good control with little or no crop yield loss (Darwent and Smith, 1985). Waiting until wild oat was in the three- to four-leaf stage resulted in good control, but some yield loss. A Manitoba study on oat found that wild oat populations were reduced drastically by delaying seeding from early May to late May, without sacrificing crop yield (Fig. 1; Schoofs et al., 2002). Fig. 1. 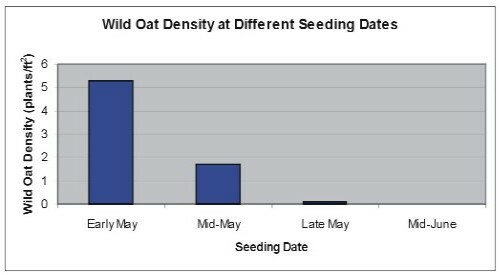 Effect of seeding date on wild oat density and oat yield. Adapted from Schoofs et al. (2002). Delayed seeding can have negative effects on crop yield, however. A study on barley found that early seeded barley (late April or early May) yielded 113 to 134% of the site average, while late-seeded barley (mid-June) yielded only 54 to 76% of the site average (Juskiw and Helm, 2003). Similar results were found with oats in the eastern prairies (May et al., 2004). Table 1. Crop rotations used in a study on wild oat management. In the fourth year of the rotation, rotation five (grain millet-dormant canola-winter wheat-pea) had the highest weed and wild oat density (Table 2). Rotations four and five were weedy due to the lack for grass weed control in the proso millet year. Rotation six had the lowest weed numbers in all phases of the rotation due to removal of weeds from the seedbank through early harvest of winter cereals and mid season weed control prior to planting of the second crop. In moist areas of the prairies, delayed seeding may not be not a very effective wild oat management strategy. Table 2. Density (plants/m2) of wild oat seedlings prior to in-crop spraying in 2003, the fourth year of a four-year wild oat management study. Avoid seeding during the main flush of weed emergence in spring. Early seeding, before most weeds emerge, can give the crop a competitive edge over the weeds. Delayed seeding allows farmers to control the first flush of early-emerging weeds before seeding the crop. Seeding should not be delayed too long, or yield loss will result. Darwent, A.L. and J.H. Smith. 1985. Delayed seeding for wild oat control in rapeseed in northwest Alberta. Can. J. Plant Sci. 65:1101-1106. Juskiw, P.E. and J.H. Helm. 2003. Barley response to seeding date in central Alberta. Can. J. Plant Sci. 83:275-281. May, W.E., R.M. Mohr, G.P. Lafond, A.M. Johnston and F.C. Stevenson. 2004. 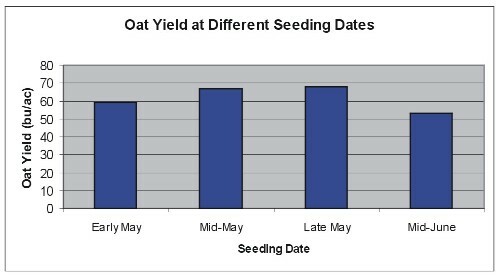 Early seeding dates improve oat yield and quality in the eastern prairies. Can. J. Plant Sci. 84: 431-442. Principles and Practices of Commercial Farming. 1968. Published by Faculty of Agriculture and Home Economics, University of Manitoba, Winnipeg, MB. Schoofs, A., M.H. Entz, and W. May. 2002. The influence of seeding date and seeding rate on PFP oat production. Unpublished research report.